Be it in wood, spider silk, in tendons, the spaces between body cells, or as a natural sealant for small wounds: protein fibers are found almost universally in nature. These small protein fibers also termed as protein nanofibers by experts, often have exceptional properties such as biodegradability, a high stability, or antibacterial effect. Artificially making these fibers is not easy, much less allotting them particular functions. That and how fibers with new properties can be effectively created is currently being reported by materials scientists from Friedrich Schiller University Jena (Germany) in the most recent issue of the renowned journal 'ACS NANO' (DOI: 10.1021/acsnano.7b07196). This is a result of a partnership with a team from the Leibniz Institute of Photonic Technology in Jena (Leibniz-IPHT). "Protein fibers consist of several natural protein macromolecules", explains Prof. Dr. Klaus D. Jandt from the Otto Schott Institute of Materials Research at Jena University, and continues: "Nature builds these nanomaterials, whose diameter is roughly a 1,000 times smaller than that of a human hair, by way of self-assembly processes." What poses little difficulty for nature with its millions of years of experience is typically not that easy to create in a laboratory scenario. Prof. Jandt and his team have in the past few years, however, succeeded in making protein nanofibers from the natural proteins fibronectin and fibrinogen and regulating their size and structure - branched or linear. The researchers of Prof. Jandt's group subsequently aimed to predefine precise properties of the protein nanofibers for their later use as components in biosensors, optical probes, drug delivery particles, or bone cements. To achieve this, the researchers from Jena decided to combine two different proteins in a self-assembling protein nanofiber to make new fiber properties this way. Jandt and his team were successful: they used the protein albumin, which is responsible for the osmotic pressure in the blood, and hemoglobin, the protein of the red blood pigment facilitating oxygen transport in the blood. The researchers dissolved both these proteins in ethanol and then heated them to 65 °C. Over several interim stages, this resulted in the seemingly autonomous formation of new hybrid protein nanofibers having both proteins for the very first time. This comprises a so-called handshake between the two proteins, meaning that similar sections of both join to form a fiber. Proving that these new hybrid protein nanofibres indeed contain both proteins was not easy as the new fibres are so tiny that there are hardly any microscopy methods able to see details in them. We were provided with decisive support for this proof by Prof. Deckert and his team from the Leibniz Institute of Photonic Technology. Prof. Dr. Volker Deckert and his team found optical signals in the new hybrid nanofibers that are as representative for albumin and hemoglobin as a fingerprint is for a person. They depend on the so-called tip-enhanced Raman spectroscopy (TERS) for this. 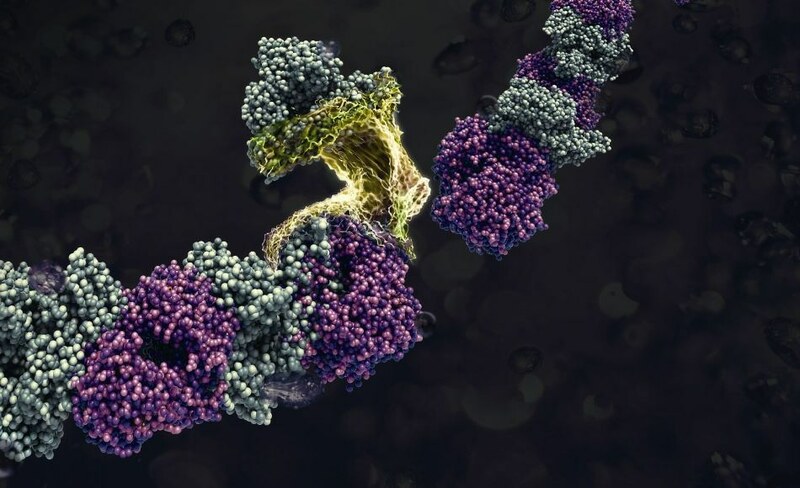 "The method's extreme sensitivity allowed us to identify the different proteins even without special markers, and also permitted their unambiguous classification in close cooperation with Prof. Jandt's colleagues", says Prof. Deckert from the Leibniz-IPHT in Jena. The researchers from Jena regard the creation and proof of the new nanofiber comprising several proteins as an innovation. The innovative fibers can at present be used for the targeted construction of completely new, larger structures with the desired properties that could not be created thus far. Networks of the new nanofibers are to be used as a new material for regenerating cartilage and bone in the future, for instance. This has opened the door for a completely new generation of functional materials for medical engineering, nanoelectronics, sensorics, or optics, all based on natural substances and construction principles. These biomimetic principles will have a decisive effect on the materials of the future. The team from Jena is assured that this new self-organization method can also be effectively transferred to other proteins provided they feature identical amino acid sequences in parts. This project was aided by the German Research Foundation DFG under the project name "Novel functional materials based on self-assembled protein nanofibers: creating and understanding nanofibers".